Is this the first 8-inch Windows 8 tablet? 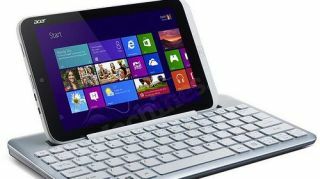 Acer may soon offer up the first 8-inch Windows 8 tablet, a device dubbed the Iconia W3. This is according to Minimachines.net (Google translated) which posted an army of images purportedly of the unannounced device. The Iconia W3 measure 8-inches from corner to corner and is said to come with a dual-core Atom Z2760 processor with hyper-threading. Clocked at 1.8GHz, Minimachine and we agree that it's not a "monster" when it comes to performance, but hey, size is sort of the selling point here. There's also apparently 2GB of RAM, a dual camera and speaker set-up and spaces for perhaps microUSB and microSDHC. Microsoft last week made clear that smaller touch-enabled devices are indeed on the way from its OEMs, and Acer may be well on its way to making good on that promise. While there's a greater than good chance Microsoft is developing its own smaller version of the Surface tablet, Acer's leak has anything from Microsoft beat out of the gate. Minimachines states the slate will be out by the time the school year starts again (mid-August-ish), which while it makes a lot of sense doesn't have official backing, so we can't take it (or any of the leak's information) as gospel. As you can see from the photos, the Iconia W3 will have the option to sit inside a keyboard, which one can type on but not use for syncing or charging.